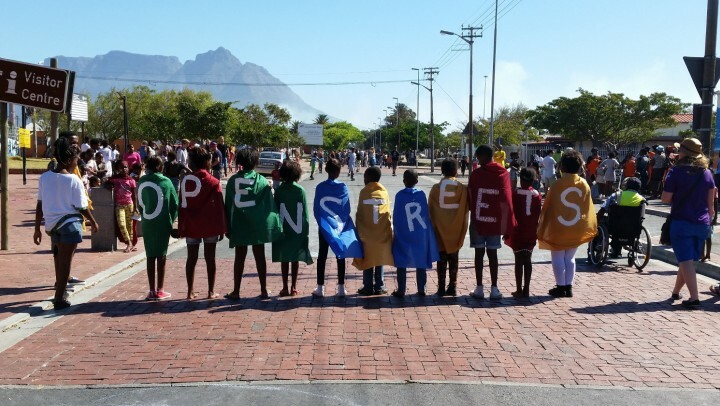 Thanks to the ongoing support of the City of Cape Town and its residents, Open Streets Cape Town (OSCT) is able to announce a new era for its flagship programme. Open Streets Days, a citizen-driven celebration of public space, has grown into a series, and we'd like to invite you to four upcoming dates. The series kicks off on Sunday 30 October 2016 in Langa, where for the third time King Langalibalele Drive (previously Washington Street) will become a car-free playground. Kids and adults will be able to dance, play, cycle, skate, explore, connect and showcase local projects in the transformed space. On the same day, OSCT will run Cape Town’s first ever low-carbon transport race, the ‘AtoB Challenge’, in which teams will compete to arrive in Langa with the smallest carbon footprint. OSCT partner WWF Nedbank Green Trust will determine the winners by the modes of transport they use in their journey. Find out more here. After Langa, Open Streets Days will return to three other locations. An Open Streets Day is an opportunity for all to explore a street as a space that connects people. It suspends reality for a few hours and shows a glimpse of what our future could be. Now that we have series of Open Streets Days, Capetonians will have more opportunities to re-imagine their city! ‘Open Streets’ is a 40-year-old global movement. It was inspired by Bogotá’s Ciclovía, the largest national recreational programme in Colombia, which turns 120km of streets into car-free space across the city every Sunday and public holiday. More than 400 cities around the world have developed similar programmes and Cape Town is taking the lead in running Open Streets in Africa. What is Open Streets Cape Town the organisation? A group of volunteers founded Open Streets Cape Town (OSCT) in 2012. It is now a registered NPO supported by the City of Cape Town, the WWF Nedbank Green Trust, the Greater Tygerberg Partnership and the Millennium Trust. OSCT works to challenge the paradigm of urban mobility by carrying out campaigns, temporary interventions, dialogues and walks that raise citizen awareness, spark public debate, and ultimately drive behaviour change around the role of streets in the life of the city. Open Streets Days are the flagship programme of the organisation. Our aim is to create shared spaces that bring people together for an equitable, integrated, sustainable, safe and vibrant Cape Town.